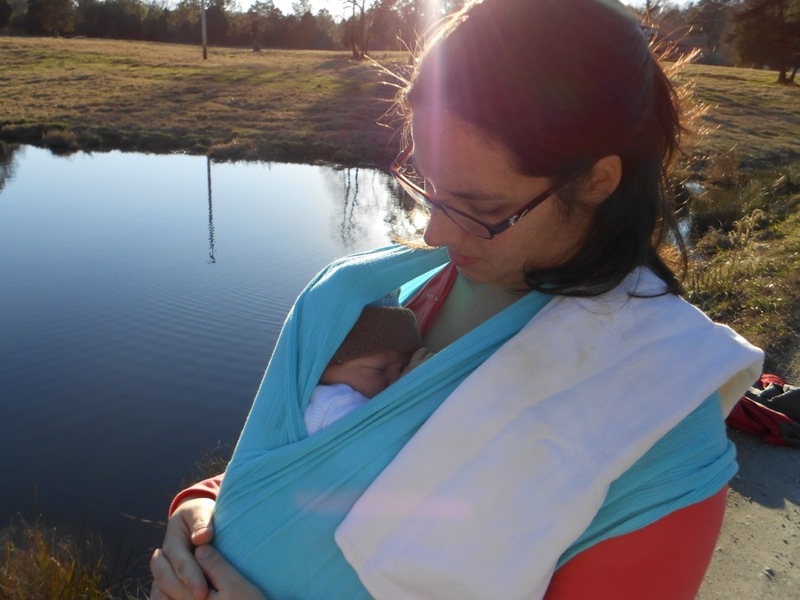 This is my 8th installment of Babywearing Stories 365. Each installment features a babywearer in 1 photograph and their answers to 5 questions. My goal is to normalize, promote and celebrate daily Babywearing, moving beyond *what* we use to carry our babies and shifting focus back on *why* and *where* we carry. I hope to share the stories of moms, dads, and babywearing caregivers all over the world. Enjoy! My name is Renee and I am wearing my fourth child Daniel. It was a pretty nice day in January so we decided to venture out as a family to enjoy the weather. We trekked through the cow pasture to the cow pond at my husband’s aunt and uncle’s house. I grabbed my Wombfruit gauze wrap for the outing. My son was/is a big boy so legs in just wasn’t working for us and the bulk of my other wraps (Storch Leo and Nati Violette Stripes) was just too much for him for legs out. It worked perfectly. There is no way a stroller would have worked – we had to climb over the fence, walk through the pasture, go over/through a creek, and back up a rocky hill to get there. It also freed up my hands to help with worms and tangled lines. As mentioned above a stroller would have been impossible in this situation. I also have a bad back/neck so any help with weight distribution is needed whenever possible. There is absolutely no way I could have carried him safely to get to the pond or held him for that long of a time period. In general I baby wear for the comfort (me and baby), to get those snuggles in when I otherwise wouldn’t be able to (my other children are 5, 3 and 1), to get things done around the house, to nurse in public discreetly, and to be able to keep up with the other little ones at home or away.